The pace is picking up here at our subterranean lair. Cabernet Franc and Pinot Noir are looming in the next few days, but last week, it was Grenache — the first time we’ve tackled this RhÃ´ne varietal. I made the trip with Garagiste Whit in mid-80s Ford F-150 which was loaned to us by Bill, a warm and generous friend of Erik’s now retired from the carpentry business. Pulling into the vineyard in that rig made us feel a little less like the yahoos we are. The vineyard manager warned us that the sugars might be high, but we saw a lot of unevenness in the clusters, so we set up our first-ever sorting table (pictured above). As we later learned, the sugars were indeed high, but I’m convinced that culling the surprising percentage of unripe and sometimes green berries will make this a purer wine. 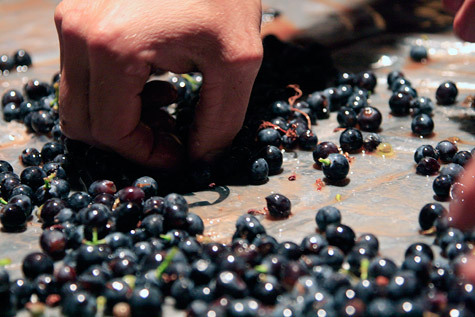 After all, grapes aren’t just about sugar, and the bitter, vegetal flavor of unripe ones can really swerve a wine. In any case, since we’ve never made Grenache, I can’t say whether the fruit was typical, or whether this oddball year made it this way, but this may give Pinot Noir a run as our most challenging harvest. 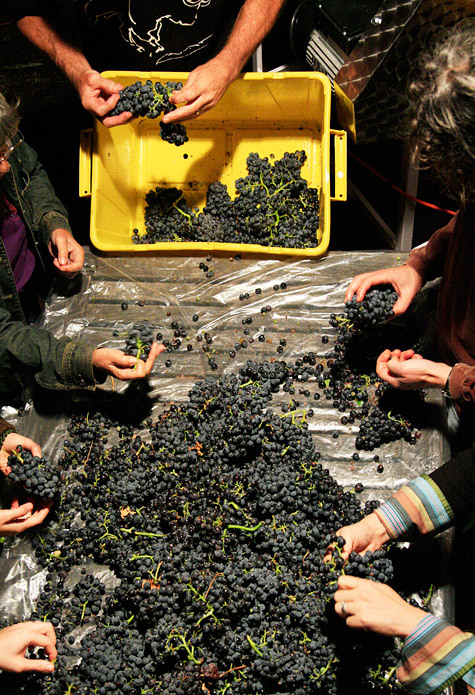 The sorters diligently scanned every cluster for leaves, green berries, and the telltale pink/magenta tint of unripeness. Keen eyes even pulled out a little bunch rot, though the harvest was overwhelmingly healthy. The top of Sugar Loaf Vineyard, looking south toward the Gorge. A truly lovely spot. 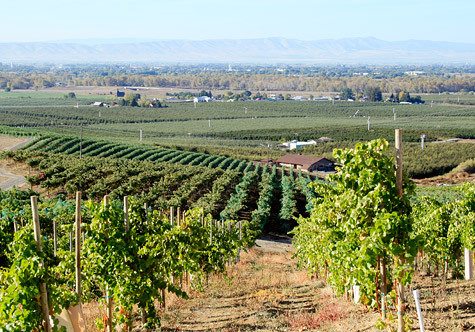 In a scene repeated in just about every vineyard in Oregon and Washington with fruit still hanging at this late date, vines wrapped in nets to keep hungry birds at bay. 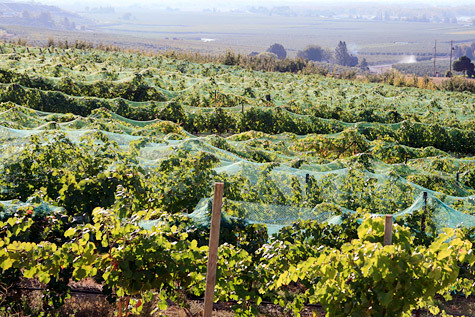 Usually the harvest is earlier by at least a few weeks, so by the time migrating birds pass over the vines, the vines are largely bare. Not this year: a cool summer and rainy fall pushed the harvest like a room service meal straight into the birds’ path. It’s even more intense in Oregon, where camo-like nets are combined with propane cannons to conjure a battle scene out of M*A*S*H.
The bitter — or actually, bitter-free — end, ensuring no bitter berries sneak past into the ferment. 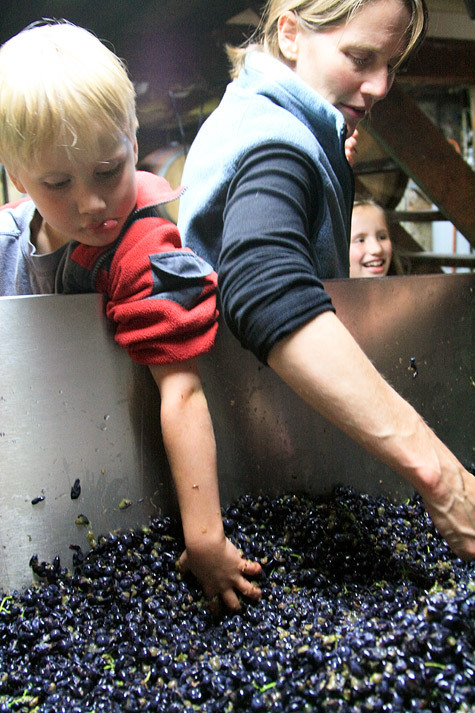 A big part of what makes a Garagiste harvest so fun is little winemakers showing up to lend a sticky hand. Here, after the berries have tumbled down into the basement fermenter, Garagistes Sten and Catherine remove astringent stems that have evaded the rotating blades of the crusher above. Well, okay, maybe only Catherine’s doing that — Sten’s more about tossing them around… uh, but look at that concentration! Holy crap, what a feast afterwards. 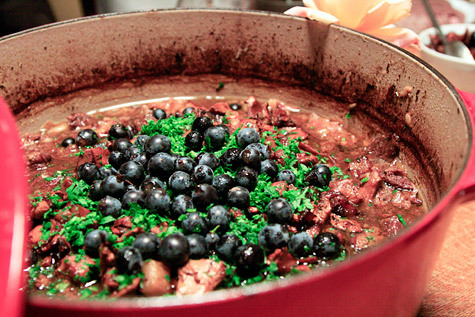 Among many delicious treats people brought, Garagiste Hal whipped up a rich and complex beef stew made with some of our “second wine“, herbs from his garden, and green peppercorns, garnishing it with fresh Grenache berries. Wow. Not only is this harvest a joy to see from this slight remove, I remember the “sticky hands” part from back in my day when I would toss clusters into the sorter. Never, tho, did I have to look for the too small or sour grapes, the kind of methodical tedium that excellence requires! I was lucky enough to see Matt drive off in the aforementioned very substantial truck, the truck that transformed the day. Here’s to the trucks, the vines, the friends, meals and gears that shift us from intentions into action! Thanks for this look at the latest batch.